Detergents and Related Products | Biochemicals | BioVision, Inc.
Detergents are amphipathic molecules that contain both polar and hydrophobic regions which allow them to act as solubilizing agents. The polar region can form hydrogen bonds with water while the hydrophobic region tends to aggregate into micelles and associate with hydrocarbon and nonpolar domains. The fundamental properties of detergents include: the critical micellar concentration (CMC, the concentration above which micelles form); the Kraft Point (the temperature at which an equilibrium exists between the insoluble crystalline state, the monomeric detergent and the micellar state; this temperature is usually equal to the critical micellar temperature, CMT); the aggregation number (the number of detergent molecules within a micelle, which equals micellar MW/monomeric MW); the Hydrophile-Lipophile Balance (HLB, a measure of the hydrophilic nature of the detergent. An HLB between 12-20 is preferred for non-denaturing solubilization and > 20 for extrinsic protein solubilization); For non-ionic detergents, the Cloud Point is the temperature above the CMT where detergents become cloudy forming a detergent-rich phase and an aqueous layer. This is useful to separate integral membrane proteins from hydrophilic proteins after first solubilizing at low temperature (e.g. Triton X-114 has cloud point = 23 °C). Detergents can be grouped into a few main classes: Ionic detergents ; Non-ionic detergents and Zwitterionic detergents. Ionic detergents have a charged headgroup (anionic or cationic) and are useful for the complete disruption of cells and denaturation of proteins for separation during SDS-PAGE. These can include anionic detergents like SDS, cationic detergents such as CTAP and anionic bile salts such as deoxycholate. 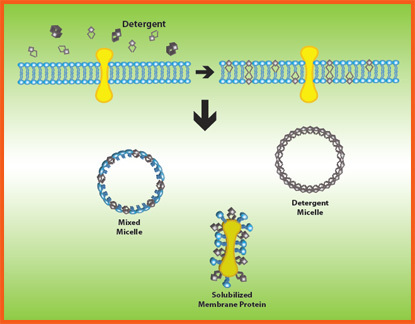 Non-ionic detergents, often called non-denaturing detergents, are useful in the solubilization of membrane proteins since they are able to break lipid-lipid and lipid-protein interactions, but have a limited ability to break protein-protein interactions. They include low CMC detergents such as Triton X-100 and a NP-40 alternate which cannot be dialyzed away, uncharged bile salts like Big Chap (which can be dialyzed) and the very dialyzable (CMC ~ 25 mM) alkyl glucosides such as octyl glucopyranoside. Zwitterionic detergents protect the native state of proteins without altering the native charge of the protein molecules. In addition to solubilization properties alone, zwitterionic detergents are very useful for isoelectric focusing and 2D electrophoresis. Many synthetic zwitterionic detergents are known as sulfobetaines. Sulfobetaines retain their zwitterionic characteristics over a wide range of pH and are widely used for 2D gel electrophoresis.